Mark Pettini became the third of Leicestershire’s experienced winter recruits to score a hundred for their new county to set up the possibility of a second win out of three in the Specsavers County Championship. The 32-year-old former Essex captain walked off with an unbeaten 142 – his highest Championship score for nearly a decade – when Leicestershire declared with a first innings lead of 310 at 473 for 8. They left Sussex effectively needing to bat four sessions to survive but the hosts produced a spirited response as openers Ed Joyce, who passed 50 for the second time in the game, and Chris Nash batted 39 overs without being parted to take their team to 113 for 0 at stumps, still 197 behind. But this was Pettini’s day as he followed Paul Horton, who made 100 on the second day at Hove, and Neil Dexter, who lodged a hundred against Kent last week, in making a good early impression for their new county. Brighton-born Pettini didn’t offer a chance in more than four and a half hours of patient accumulation as he made the most of a good batting pitch. Sussex’s attack toiled away manfully but they lacked the discipline shown by Leicestershire’s bowlers earlier in the match, contributing 56 extras including 29 no balls. The 32-year-old had extended Leicestershire’s fifth wicket stand with Niall O’Brien to 142 during the morning session when Sussex employed six bowlers but couldn’t make the breakthrough. O’Brien went to his 50 with a six and four off Danny Briggs, but it was Sussex’s other slow bowler – leg-spinner Luke Wells – who helped stall Leicestershire’s progress when four wickets fell in eight overs after lunch. Steve Magoffin had O’Brien caught behind for 55 then Wayne White was foxed by Wells’ googly and Ben Raine bowled heaving through the leg side. McKay chipped Magoffin’s slower ball to mid-on at which time Pettini went on the attack, hitting Briggs for two straight sixes in an over before launching Wells over mid-wicket. When the declaration came Pettini had faced 238 balls and also hit 13 boundaries. Leicestershire nearly broke through before tea when Nash, on nine, was dropped at slip by Horton off McKay but their seam attack found the unresponsive surface as tough as Sussex’s had, although McKay made both openers play and miss several times in lively spells either side of tea. 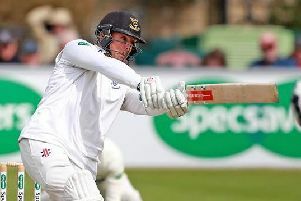 Joyce passed 17,000 first-class runs when he reached 37 and he also forced Leicestershire skipper Mark Cosgrove to leave the field after he appeared to hurt his knee stopping a full-blooded drive at mid-off.